Nubia is a sub-brand of ZTE just like ZUK is (was) of Lenovo. The company has launched some excellent devices in the past, and the most recent announcement from the company was Z17 Mini with 6GB of RAM and dual 13MP cameras. 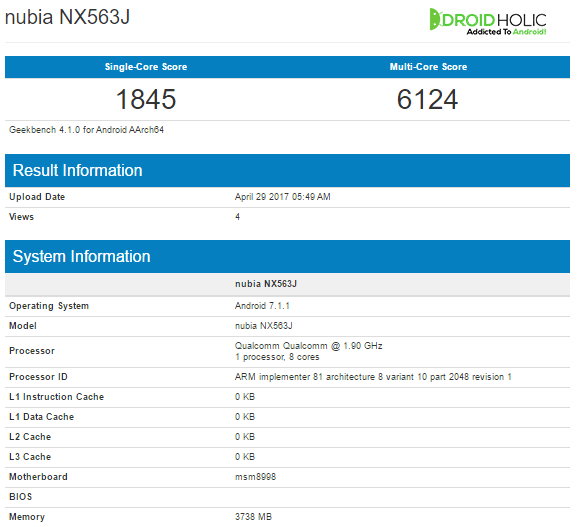 Today, a new Nubia device (Nubia NX563J) has been spotted on Geekbench, and one of the highlights of the device is the processor. The device is powered by the octa-core 1.9GHz Snapdragon 835 processor which makes it one of the few devices at the moment that is having the latest Snapdragon processor. The phone goes by the model number Nubia NX563J, and it could be the Nubia Z17, but we are not sure yet. The phone is powered by the Android 7.1.1 out of the box and has 4GB of RAM. There is not much information about the device yet, but it scores 1853 on Single Core and 6379 on Multi-Core which is almost similar to what the Galaxy S8 scores. So, if the device turns out real, it will be yet another tough competitor for the Galaxy S8.